Free Shipping Included! 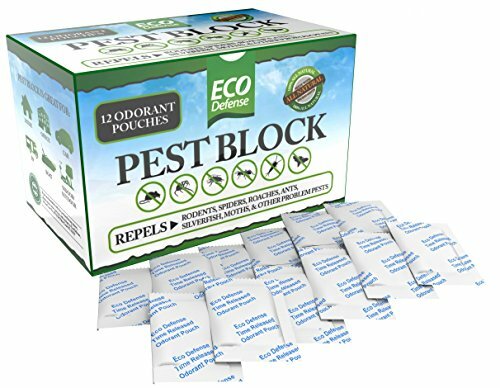 Eco Defense Pest Control Pouches - All Natural - Repels Rodents, Spiders, Roaches, Ants, Moths & Other Pests - 12 Pack - Best Mouse Trap Alternative by Eco Defense at The Net Stores Network. MPN: 4316279784. Hurry! Limited time offer. Offer valid only while supplies last. Eco Defense Pest Control Pouches are THE SAFE alternative to chemical based pesticides and poison. Are you tired of:- Chemical Based Toxic Products? Eco Defense Pest Control Pouches are THE SAFE alternative to chemical based pesticides and poison. - Chemical Based Toxic Products? - Ineffective and Expensive Monthly Treatments? - Risking your child, family, and pets health? Isn't it time for a better alternative? - Repels & Deters of Pests Including: Rodents, Mice, Spiders, Pantry Moth, Snakes, Roaches, and other problem pests. 1 Pouch ALL PESTS. - All Natural Encapsulated Essential Oils are completely safe and conveniently packaged in in easy to use pouch form. The perfect alternative to a Mouse Trap, Rat Trap, Rat poison, Roach Killer, Insect Killer, Moth Trap, Moth Balls, or Pest Repeller. 1 Pouch ALL PESTS. Order Now and Start to Protect Your Home From Bugs And Pests. NATURALLY REPEL PESTS - A patented encapsulation process combines the ultra powerful combination of essential oils in a convenient to use pouch form, proven to repel a multitude of different pests. Cedar, Cinnamon, Lemongrass, Rosemary, Mint, and Peppermint oil create the ultimate pest control barrier. LONG LASTING PROTECTION - Our 12 PACK of Pest Control Pouches last from 6 months to 1 year. Place in a small-enclosed area to repel Rats, Mice, Spiders, Silverfish, Roaches, Ants, Pantry Moth, Snakes, and dozens of other pests. The most effective Mice Repellent and more effective and humane than a Mouse Trap or Rat Trap. NO MESS, EASY TO USE - Simply place 1 odorant pouch in any enclosed space up to 10 cubic feet to deter pests from intrusion or nesting. Perfect for closets, pantries, vehicles, RV, practically anywhere. Makes for a Prefect RV Accessory. SAFE AND ECONOMICAL - Pest Block Pest Control Pouches are the safe alternative to chemicals and poison. The clean fresh smell of 100% pure essential oils repel pests & are always safe around you and your family. The perfect alternative to a Mouse Trap, Rat Trap, Rat poison, Roach Killer, Insect Killer, Moth Trap, Moth Balls, or Pest Repeller. 1 Pouch ALL PESTS. MONEY BACK GUARANTEE - Try Our Pest Control Pouches 100% Risk-Free for 60 days and if you are not absolutely satisfied with the pest repelling results, we will immediately refund your entire purchase.